Summertime is upon us and if you’re in need of a refreshing DIY project sure to brighten up the long, hot days then you’re in luck! Hi friends, Linsey here today sharing a fun craft perfect for getting the kids off the couch and be creative! Come along and see how I made this fresh and fun pinwheel wreath! There is some great pinwheel wreath inspiration on Pinterest and I was inspired by it all! 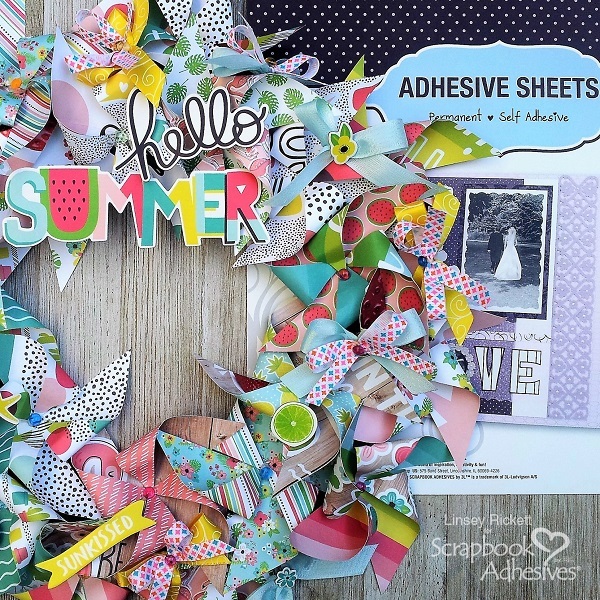 My wreath came together rather easily using a few different Scrapbook Adhesives by 3L® and this cheerful summertime-themed paper collection. Using various summer themed patterned papers, I cut 4 x 4″ squares to make a total of approximately 20-22 squares for a small wreath form. Next, fold squares in half to make a triangle and then unfold. Repeat on opposite side. Cut each of the 4 corners about 1/2 to the center using the fold lines as a guide. Now fold every other corner and adhere to the center with E-Z Runner® Grand Refillable Dispenser and E-Z Runner® Grand Ultra Strong Refill. Did you know it takes seconds to refill our E-Z Runner Grand Dispensers? View a short view on How to Use and Refill the E-Z Runner Grand Dispensers. A center decoration is optional and I chose to add brightly colored gem circles to the centers of all my pinwheels. The Adhesive Dots Micro were the perfect size for the gem circles and they adhered to the center of each pinwheel. The wreath form was covered with Adhesive Sheets 12×12 inch and the pinwheels arranged and adhered accordingly. Placing a single row of pinwheels around the form is ok, but I placed my pinwheels in 2 rows, leaving a few gaps for the ribbons and chipboard title embellishment to be added with 3D Foam Circles White Mix and 3D Foam Squares White Mix. This simply makes for a more full wreath and either way will look great! Thanks for stopping by! 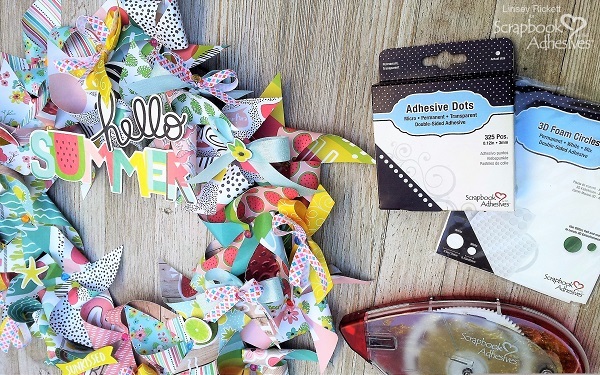 I hope my festive summertime pinwheel wreath has you spinning with inspiration and ideas for making your very own! Until next time, happy crafting! This entry was posted in 3D Foam Circles, 3D Foam Squares, 3D Projects, Adhesive Dots & Lines, Adhesive Sheets, Adhesives, Beginner, Crafts & Tutorials, E-Z Runner® Grand, Home Decor, Permanent Adhesive, Seasonal Craft Ideas, Skill Level, Summer and tagged 3D Foam Circles White Mix, 3D Foam Squares Mix White, 3D Foam Squares Regular White, 3D Foam Squares Small White, Adhesive Dots Micro, Adhesive Sheets 12x12" (25 sheets), Adhesive Sheets 12x12" (5 sheets), Adhesive Sheets 6x12", DIY, E-Z Runner Grand Dispenser, E-Z Runner Grand Ultra Strong Refill, Home Decor, Linsey Rickett, Wreath. Bookmark the permalink. 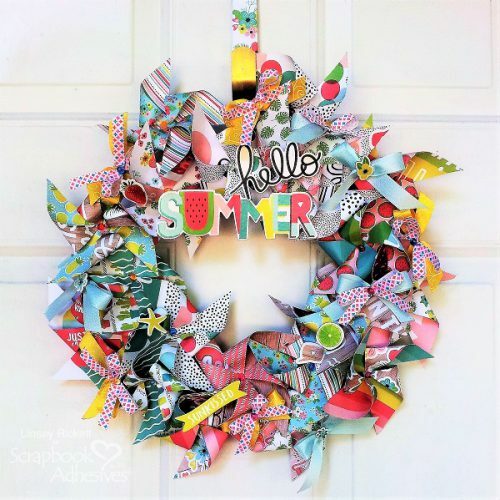 2 Responses to "DIY Summertime Pinwheel Wreath"
I love this wreath..so colorful and festive!! Would love to see a video on the construction. What kind of wreath form was used and exactly how did she cover it with 12 x 12 adhesive sheets? I have the same comment as Patty. 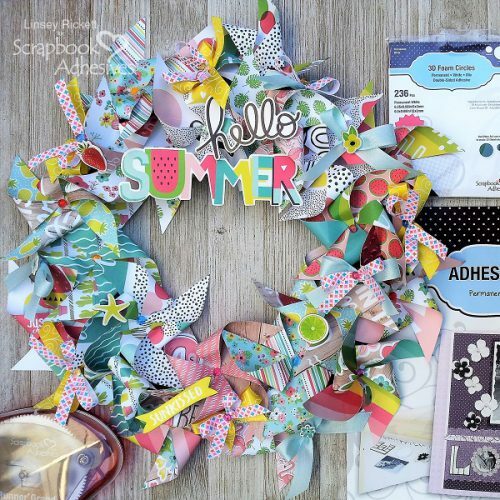 I absolutely WANT to make this wreath and would like to know what kind of wreath form was used and how did she cover it with the adhesive sheets. It is totally adorable.